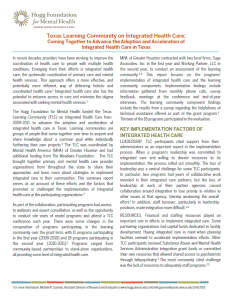 In 2009, the Hogg Foundation awarded a one-year grant to Mental Health America (MHA) of Greater Houston to create a statewide learning community on integrated health care. Members collaborated in person and online to share information and experiences with implementing different integrated health care models, components and strategies. In 2010, the grant was extended for an additional year and expanded to eighteen learning community participant organizations throughout Texas. MHA of Greater Houston contracted with two local firms, Sage Associates, Inc. in the first year and Working Partner, LLC in the second year, to conduct an assessment of the learning community. The foundation has aggregated findings from the assessments.